Please Join Us in Congratulating Gantz Chiropractic, LLC as May's Logan County Chamber Business & Entrepreneur of the Month. 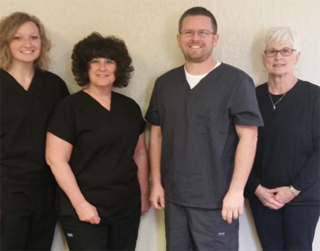 Roughly twenty-five years ago, Dr. Lance Heath founded what became known as Bellefontaine Health & Wellness and began serving the chiropractic health needs here in Logan County. In 2004, a young new doctor, Kyle Gantz, interned with Dr. Heath and not long after, joined his practice. This business relationship continued for the next 12 years and when Dr. Heath decided to relocate to Florida, Dr. Gantz was offered the opportunity to purchase the business. This transition resulted in what is now Gantz Chiropractic, LLC. Dr. Heath instilled in his young intern the importance of customer care and faithfully pointed all staff members to deliver the highest care to the best of their ability. "I could not have had a better mentor, or employer to show and help me manage patient care and take care of people," Gantz said. Gantz Chiropractic currently offers a variety of services including Chiropractic Care, Reflexology, Electronic Muscle Stimulation, Ultrasound Therapy, Decompression Therapy, and Nutritional Supplementation. When asked to share an interesting fact about his business that might not be well known, he stated that chiropractic care is beneficial to all ages from newborn to the aged, and is safe for women during all stages of pregnancy. He added that some of the most notable improvements in chiropractic medicine have been obtained with newborn babies. Dr. Gantz sited patient word of mouth as his only marketing strategy. "We are in the 'taking care of people business,' and I am a firm believer that if you take care of people, they will take care of you." Patient recommendations and referrals drive their business and they are grateful to their patients for spreading the word! Gantz settled in Logan County because this has always been his home. He attended Calvary Christian School from Kindergarten through 8th grade and was a Riverside High School Graduate. He and his wife Kristy reside in Logan County with their three children. He believes that Chamber membership is important for supporting local business and believes that we all benefit when we utilize the services of local businesses. We thank Dr. Lance Heath and Dr. Kyle Gantz and their team at Bellefontaine Health & Wellness, now known as, Gantz Chiropractic, LLC for their 25 years of Chamber Membership and for their service and commitment to Logan County.